Undergraduate/Masters/PhD Programs: I attended the University of Montana in Missoula to get my Bachelor of Arts in Music, then again after a year off to get my Bachelor of Music Education. A few years after that, I earned my Masters of Music through the American Band College of Sam Houston State University. Naturally, as a Missoula native, I was exposed early on to the fine music department there and had the right teachers for where I was as a musician, and later for my teacher training. The ABC program allowed me to work during the school year and earn my Master’s degree during the summer. Inspiration For Becoming a Professor: I started coaching my little brother’s soccer team as an assistant when I was in college. 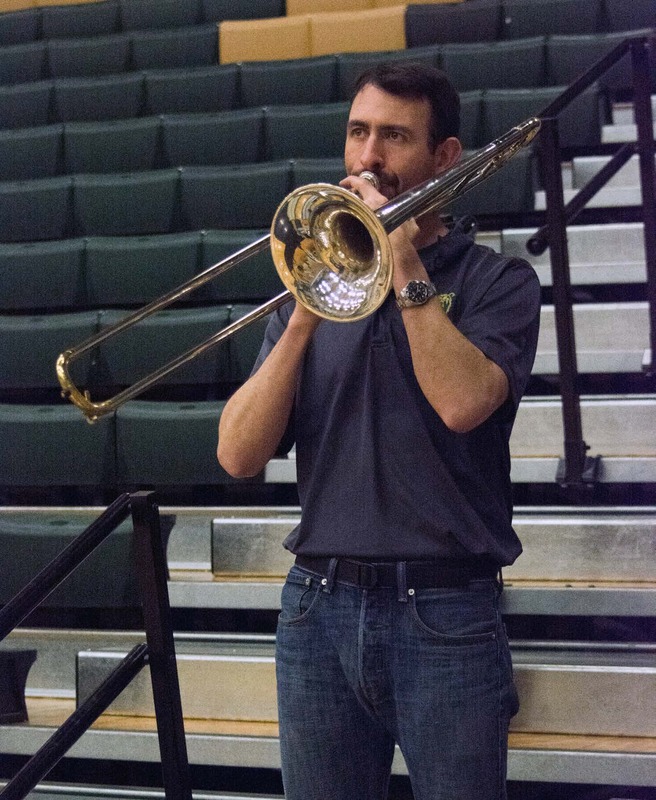 On top of that I was teaching middle school students trombone, and I caught the bug to do it as a profession. The Definition of Education: Education means I have an opportunity to learn something new every single day. Draw to Rocky Mountain College: My wife was already teaching here when I was hired, but I had aspired to teach at a small Liberal Arts institution after my experience at UM studying music and traveling abroad. The Best Things About Being a Professor: The best thing about being a professor is being around so many intelligent people every day. Advice For New Students: My advice to freshmen: Sit down and write the best possible recommendation letter for yourself, then spend every single day working to live up to the standards you’ve set. This Year’s Agenda: I look forward to the birth of my son near the end of March. Goals: Professionally, I would like to be published in the world of jazz arranging or composing in the next five years. I would also like to become a better trombone player and brass teacher. As a teacher here, I would like to grow the numbers in the bands and in the program overall.